The NAO robot platform of the French company Aldebaran Robotics is a platform for teaching and research. Experiences with the use of robots at the TH Wildau and also internationally show that students are particularly highly motivated in such projects and set themselves significantly better learning successes. An appropriate programming platform enables a quick start into the work with the NAO robots and provides the basis for complex research and development projects. Experiences from study courses with the Nibo2 robot are used to implement further events with the NAO robot. First experiences in humanoid robotics with the help of the robot Bioloid served as a model for theses. 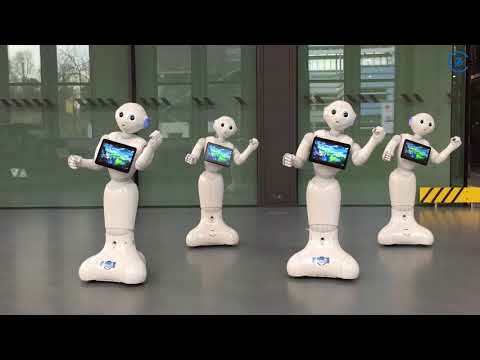 We had the opportunity to welcome four Pepper robots to our laboratory recently and developed a choreography for all of them. The result is impressive. The dance is a self-creation (including programming) by Julia Reinke and Victoria Bathe from the Telematics program. As you can see, every robot has its own head. At this year's Leipzig Book Fair on March 15.-18. visitors were able to get an idea of ​​the humanoid robot NAO. At the booth of the Federal Government, the RoboticLab informed about deployment scenarios of humanoid robots and gave an insight into the interaction with robots. Before Pepper starts working as an assistant in the library, NAO has attracted a lot of attention. The interest in robotics was great. The humanoid robots NAO and Pepper from Softbanks Robotics (formerly Aldebaran Robotics) are being used. Both models are programmable and versatile in their hardware configuration. They are ideal for social robotics projects. The city library of Wildau and its cooperation partner, the RoboticLab of the TUAS Wildau, won the Innovation Award for Libraries, granted by the federal states of Berlin and Brandenburg 2017 on October 23, 2017. With the project "Reading support with handy humanoid robots", the robot is used to create a tandem of a child reader and a non-human partner to motivate and support children in learning to read. In addition to the city library Wildau four other projects were nominated by the jury. The innovation prize was awarded for the first time by the Berlin-Brandenburg Stiftung Bibliotheks-Forschung e.V. in cooperation with the educational institutions and library associations of the region. Dirk Wissen has conducted an interview with Wilma (in German) in the library of the TUAS Wildau for the current issue of the journal BuB: Forum Bibliothek und information. The issue focuses on automation and robotics in libraries. Wilma gives detailed information on essential questions about tasks, beings and the future of humanoid robots. 2nd prize in the VDI competition "Mensch und Technik"
Janine Breßler won 2nd place in this year's competition "Mensch und Technik" of the VDI-Berlin / Brandenburg with her Master's thesis on the topic "Concept and development of teaching modules in the context of artificial intelligence with focus on the fields of service robotics and smart home" ! With her work she finds international recognition. For example, at this year's WomEncourage Conference of the ACM in Barcelona, ​​she was invited to talk about it. In March 2018, she will also give a talk at a STEM conference in Orlando. More about the competition "Man and Technology"
Again this year, in the context of the optional required course "Embedded Systems II" projects were successfully implemented with the humanoid robot NAO. See what our students have realized during the 2017 summer semester. Students of Telematics at the TUAS Wildau are engaged in projects and also in the context of theses with the ways of using NAO robots in applied research. Topics for working with NAOs in the Telematics laboratories are for example: Human-Robot-Interaction in the therapeutic area, Robot-Robot-Interaction, Localization and Navigation or Perception and Cognition as well as Locomotion. The Nibo2 robots, produced by nicai systems, are mainly used for entry into the world of robotics. The RoboticLab is open for students, that take part in the NaWiTex programm. Here they will learn the applications of robots in modern robotics and applied computer science and see what it takes to bring life to robots. 3rd prize in the VDI competition "Mensch und Technik"
Mathias Lindt and Max Dellüge, students of the master program Telematics of the TUAS Wildau, received the 3rd prize in the competition “Mensch und Technik 2016" of the VDI Berlin-Brandenburg for their joint project "Learn and use sign language with hEarMotion and NAO Robots!". In their project work that is part of the module "programming embedded systems with C ++”, the two telematics students had programmed "their" humanoid robot called "Annabell" to teach people the sign language and to translate selected spoken words and sentences into sign language using gestures. As a helper in the garden or indoors, as writing or transport support in the therapeutic field - application areas for working with NAO robots are diverse. Project work in the RoboticLab takes place as part of the telematics course or within the student laboratories NaWiTex. On this site we exemplarily present projects from Bachelor's and Master's theses as well as student internships.